Wine Hutch Build Part 5 #242 (04/19/2019) The finale of the wine hutch build. Wine Hutch Build Part 4 #241 (03/22/2019) I finish the drawers and the shelves. How I Made a Lidded Box #230 (06/29/2018) A cherry lidded box for my wife. Modern Drawer Box Table Part 1 #222 (03/29/2018) The carcass is dry assembled. A Cherry Bed Part 2 #211 (11/17/2017) This episode is all about the joinery! BOSCH Glide Review #208 (10/30/2017) Review of the Bosch Glide GCM12SD. Shoji Lamp #206 (10/13/2017) A shoji lamp made from sapele and rice paper. Open Bookcase Part 3 #201 (08/25/2017) The finale. Shelves and ledgers. Make a Sewing Box Pt 3 #175 (11/11/2016) I completed the sewing box. Make a Sewing Box Pt1 #173 (10/21/2016) Part 1 of the sewing box build. Cherry Bookcase Part 4 #159 (03/26/2016) The final video for the series. Cherry Bookcase Part 1 #156 (02/27/2016) Build a bookcase along side me. Edison Lamp Part 1 #148 (10/21/2015) A double pendant lamp with splayed legs. Salad Tongs #144 (08/23/2015) Make a set of salad tongs in an afternoon. Hall Table Build Part 5 #141 (07/03/2015) The finale! Build a Clamp Rack #125 (1/08/2015) Build a clamp rack from plywood. Make a Birdhouse #111 (6/02/2014) Easy to build birdhouse from cedar. Router Bowl #104 (2/12/2014) Make a bowl using a plunge router. Maple Lamps Part II #80 (4/05/2013) Part 2 of 2 for the maple lamps series. Egg Holder #78 (3/20/2013) Make an egg holder for Easter. TV Stand Part 2 #75 (2/27/2013) Drawers and guides! Make some chopsticks #73 (2/13/2013) Made from cherry and walnut. 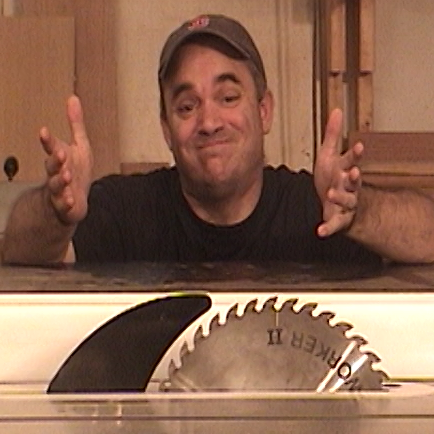 Bandsaw Template Jig #70 (1/19/2013) Make a bandsaw template jig. Taper Jig #69 (1/14/2013) Build a tapering jig for the table saw. Candle Holder #66 (12/11/2012) Make a candle holder from cherry. Bottle Opener #65 (12/02/2012) Make a neat bottle opener. Nut Cracker #64 (11/24/2012) A walnut nut cracker. Sushi Plate #62 (11/10/2012) Make a sushi plate from cherry and walnut. Miter Stop #54 (8/22/2012) Make a miter stop. Curvy Cutting Board #50 (7/16/2012) Make a cool curvy cutting board. Lost Tools #49 (7/8/2012) Ever wonder what happens to your lost tools? Peg Game #47 (5/27/2012) Make a cool peg game from scraps. Circle Jig 2.0 #44 (4/19/2012) Make a cool circle cutting jig. Shop Tour 2012 #43 (4/08/2012) A fun tour of my shop taken in 2012. Bernoulli Spiral Clamp #39 (2/19/2012) Introducing the Bernoulli Shell Clamp. Step Stool part II #38 (2/18/2012) Build a cherry step stool (part II). Step Stool part I #37 (2/10/2012) Build a cherry step stool (part I). Coat Rack part II #36 (1/28/2012) Build a wall hanging coat rack (part II). Coat Rack #35 (1/23/2012) Build a wall hanging coat rack (part I). TS Sled Alignment #32 (7/05/2011) How to align a table saw sled fence. Bookcase PartVI #31 (6/25/2011) Part VI of Cherry Bookcase. Bookcase PartV #30 (6/10/2011) Part V of Cherry Bookcase. Bookcase PartIV #29 (5/23/2011) Part IV of Cherry Bookcase. Bookcase PartIII #28 (5/14/2011) Part III of Cherry Bookcase. 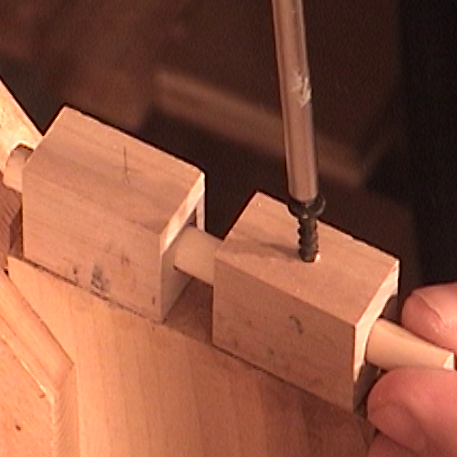 Joinery. Bookcase PartII #27 (5/09/2011) Part II of Cherry Bookcase. Toy Top #25 (2/27/2011) Make a wooden top (toy). Circle Cutting Jig #23 (12/19/2010) Make a circle cutting jig for the bandsaw. Mitered Half-Laps #11 (3/27/10) Creating mitered half-laps. Shop Tour 2009 #3 (11/22/09) Take a tour of my woodshop (2009). 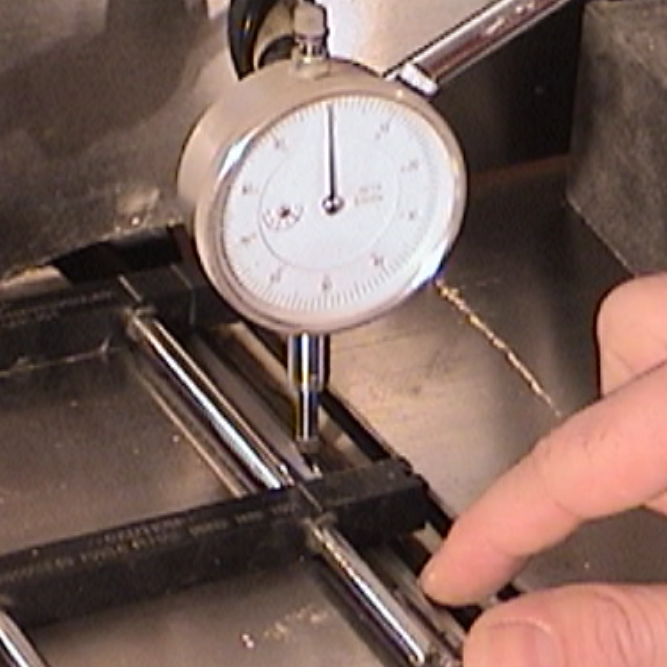 Planer and Jointer Sharpening Jig #2 (11/7/09) This is the old version. Video description: (published: 6/7/2013) Made from cherry and finished with a mixture of tung oil and varnish. Disclaimer: Follow all of the safety rules that come with your power tools.